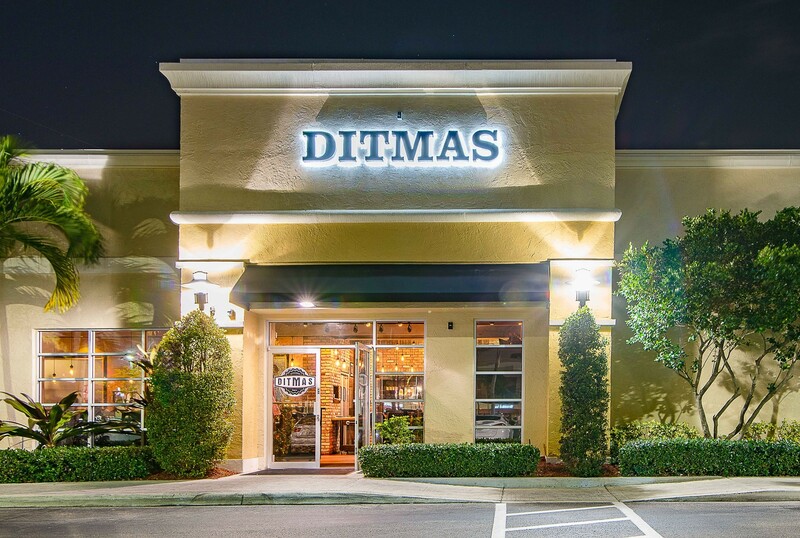 Top Chef Alumnus Alex Reznik’s latest creation, Ditmas Boca, has become the newest kosher hot spot in Boca Raton since it opened in December 2016. His wildly popular Ditmas in Los Angeles has been a favorite of locals ever since it opened in 2014. The Boca location shares some of the original Ditmas menu’s classic items while introducing some innovative concoctions. Ditmas gets its name from the avenue in Brooklyn on which Reznik grew up, and nostalgia drove him to name the original Ditmas in LA as a tribute to his upbringing. Ditmas Boca is designed with lots of detail and love as Alex and his brother custom designed and built practically every inch of it. The décor is upscale contemporary with beautiful red banquettes lining the inside dining area, striking high back comfortable chairs and a large communal table that seats up to twenty in a semi-private room. Copper piping, restored wood, white subway tile, and exposed brick can also be found inside. The outdoor dining patio is nothing short of spectacular. The outside incorporates torches, white tablecloths, candles and exquisite chairs with a Palm Tree backdrop. The food is a conglomeration of different styles from various cultures - making it contemporary American food , but done with whimsical flair, with a solid culinary foundation. Everything is as farm-to-table-fresh as possible, including locally grown produce, freshly caught Floridian fish and exclusively American meat. Ditmas classics such as the Tony Fries, Signature Short Rib dish and Kale Caesar salad are just some of the most popular menu items. Wine and beer connoisseurs rejoice! Ditmas’ wine and beer programs are diversified and extensive. Every type of wine, local microbrew and craft beer you’re hankering for is mostly likely on their menu, as well as specialty cocktails made with only fresh juices and homemade infusions. Their ginger peach infusion is enchanting. Ditmas is the perfect setting for date night, a family outing or a business meeting.